Author Andy Field takes his readers on a futuristic adventure to solve the mystery of Zack Slade’s vanishing girlfriend, and find out what is going on at the corporation JIG:SAW. 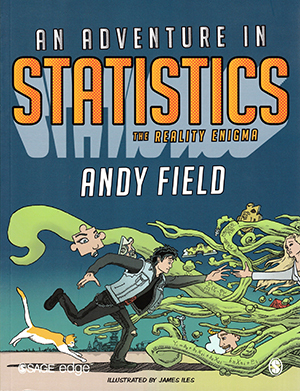 Zack discovers how statistics can be used to help find the answers he needs, and Field’s narrative, combined with illustrations by James Iles, keeps you engaged with the statistical concepts and calculations on offer. This is a comprehensive text book that walks readers through basic statistics, modern approaches to theory testing, fitting linear models and multivariate analysis. The use of the story to pose problems and explain the statistical basis and solution is both clever and effective. The book has key point summaries, exercises and a good range of online support for students and lecturers, through the publisher website and Andy Field’s YouTube channel. The story is targeted at statistics students, but if you are undertaking a research module or degree requiring statistics, then this text book will be a valuable addition to your library.